The film, starring Affleck as Mendez, and Bryan Cranston, Alan Arkin, and John Goodman in supporting roles, was released in the United States on October 12, 2012. It was produced by Grant Heslov, Affleck and George Clooney. 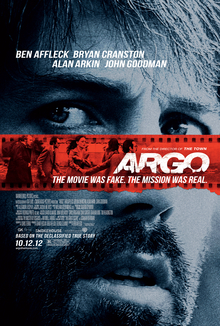 Upon release, Argo received widespread acclaim, with praise directed towards the acting (particularly Arkin's), Affleck's direction, Terrio's screenplay, the editing, and Desplat's score. The film received seven nominations at the 85th Academy Awards and won three, for Best Picture, Best Adapted Screenplay, and Best Film Editing. The film also earned five Golden Globe Award nominations: it won Best Motion Picture – Drama and Best Director, and was nominated for Best Supporting Actor – Motion Picture for Alan Arkin. It won Outstanding Performance by a Cast in a Motion Picture at the 19th Screen Actors Guild Awards, and Arkin was nominated for Outstanding Performance by a Male Actor in a Supporting Role. It also won Best Film, Best Editing and Best Director at the 66th British Academy Film Awards, and 37th Hochi Film Award for Best International Picture. Despite its praise, Argo has been criticized for some specific inaccuracies, in particular for minimizing the role of the Canadian embassy in the rescue, for falsely showing that the Americans were turned away by the British and New Zealand embassies, and for exaggerating the danger the group faced during events preceding their escape from the country. On November 4, 1979, Iranian Islamists storm the United States embassy in Tehran in retaliation for President Jimmy Carter giving the Shah asylum in the U.S. during the Iranian Revolution. 60 of the embassy staff are taken as hostages, but six avoid capture and are sheltered in the home of Canadian ambassador Ken Taylor. With the escapees' situation kept secret, the U.S. State Department begins to explore options for exfiltrating them from Iran. Tony Mendez, a U.S. Central Intelligence Agency exfiltration specialist, is brought in for consultation. He criticizes the proposals, but is at a loss when asked for an alternative. While on the phone with his son, he is inspired by watching Battle for the Planet of the Apes and begins plans for creating a cover story for the escapees: that they are Canadian filmmakers who are in Iran scouting exotic locations for a science-fiction film. Mendez contacts John Chambers, a Hollywood make-up artist who had previously worked for the CIA. Chambers puts Mendez in touch with film producer Lester Siegel. Together, they set up a phony film production company, publicize their plans, and successfully establish the pretense of developing Argo, a "science fantasy adventure" in the style of Star Wars, to lend credibility to the cover story. Meanwhile, the escapees grow restless. The revolutionaries reassemble embassy photographs shredded before the takeover and finally realize that some personnel are unaccounted for. Posing as a producer for Argo, Mendez enters Iran under the alias Kevin Harkins and meets with the six escapees. He provides them with Canadian passports and fake identities. Although afraid to trust Mendez's scheme, they reluctantly go along, knowing that he is risking his own life too. A scouting visit to the bazaar to maintain their cover story takes a bad turn when they are harassed by a hostile shopkeeper, but their Iranian culture contact hustles them away from the hostile crowd. Mendez is told that the operation has been cancelled to avoid conflicting with a planned military rescue of the hostages. He pushes ahead anyway, forcing his boss Jack O'Donnell to hastily re-obtain authorization for the mission and confirm their tickets on a Swissair flight. Tensions rise at the airport, where the escapees' ticket reservations are confirmed at the last minute, and the head guard's call to the fake production company in Hollywood is answered only at the last second. The group boards the airliner, which takes off just as the Revolutionary Guards at the airport are informed of the ruse and try to stop them. To protect the hostages remaining in Tehran from retaliation, all U.S. involvement in the rescue is suppressed and full credit is given to the Canadian government and its ambassador (who shuts down the embassy and leaves Iran with his wife as the operation is underway). The ambassador's Iranian housekeeper, who had known about the Americans and lied to the revolutionaries to protect them, escapes to Iraq. Mendez is awarded the Intelligence Star, but due to the mission's classified nature, he receives the medal in secret and has to return it afterwards. The award is restored to him after the Canadian Caper is declassified in 1997. Argo is based on the "Canadian Caper" that took place during the Iran hostage crisis in 1979 and 1980. Chris Terrio wrote the screenplay based on Joshuah Bearman's 2007 article "How the CIA Used a Fake Sci-Fi Flick to Rescue Americans from Tehran," which was published in Wired. The screenplay used by the CIA to create their cover story was an adaptation of Roger Zelazny's 1967 novel Lord of Light. Producer Barry Geller had spearheaded an earlier attempt to produce the film using the original title. After that production attempt failed, the screenplay was renamed Argo and used by the CIA. In April 2016, research by VICE, based on documents received under the Freedom of Information Act, revealed that the CIA was involved in the production of the 2012 Argo, as it was in a number of American entertainment productions (such as the well-established case of the 2012 film Zero Dark Thirty). Argo was acclaimed by critics, praising Ben Affleck's direction, the cast (especially Arkin and Goodman), the script and the editing. Rotten Tomatoes gives the film an approval rating of 96%, based on 343 reviews, with an average rating of 8.4/10. The website's critical consensus reads, "Tense, exciting and often darkly comic, Argo recreates a historical event with vivid attention to detail and finely wrought characters." On Metacritic, the film has a score of 86 out of 100, based on 45 reviews, indicating "universal acclaim". CinemaScore reported that audiences gave the film a rare "A+" grade. Naming Argo one of the best 11 films of 2012, critic Stephen Holden of The New York Times wrote: "Ben Affleck's seamless direction catapults him to the forefront of Hollywood filmmakers turning out thoughtful entertainment." The Washington Times said it felt "like a movie from an earlier era — less frenetic, less showy, more focused on narrative than sensation," but that the script included "too many characters that he doesn't quite develop." Bootleg DVDs have become popular and are estimated at "several hundreds of thousands" of copies. Interpretations of the film's popularity in Iran have varied, ranging from the fact that the movie portrays the excesses of the revolution and the hostage crisis, which had been long glorified in Iran, to Iranians viewing it as a reminder of what caused the poor relations with America and the ensuing cost to Iran, decades after the embassy takeover. The high DVD sales suggests a form of silent protest against the government's ongoing hostility to relations with America. The film was released in North America on February 19, 2013 on DVD and Blu-ray Disc. ... this House acknowledge[s] with gratitude the efforts of former New Zealand diplomats Chris Beeby and Richard Sewell in assisting American hostages in Tehran during the hostage crisis in 1979, and express[es] its regret that the director of the movie Argo saw fit to mislead the world about what actually happened during that crisis when, in reality, our courageous diplomats' inspirational actions were of significant help to the American hostages and deserve the factual and historical record to be corrected. The screenplay has the escapees—Mark and Cora Lijek, Bob Anders, Lee Schatz, and Joe and Kathy Stafford—settling down to enforced cohabitation at the residence of the Canadian ambassador Ken Taylor. In reality, after several nights, the group was split between the Taylor house and the home of another Canadian official, John Sheardown and his wife Zena Sheardown. The Swissair flight that took Mendez and the hostage group out of Tehran is shown operated with a Boeing 747-300, a type which entered service in 1983, and is painted in a livery that Swissair introduced in 1980. In real life, the group departed Iran on a Swissair Douglas DC-8. 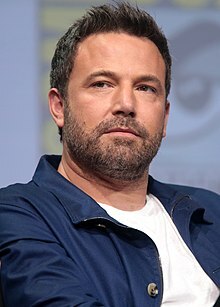 Some Hispanics and film critics criticized the casting of Ben Affleck in the role of Mendez, who is of Mexican ancestry on his father's side. Mexican-American actor and director Edward James Olmos considered Affleck's casting as Mendez a "mistake", and that the actor "had no sense of the cultural dynamic of the character he was playing". However, Mendez himself has said that he was unconcerned about the casting, and noted he does not identify as Hispanic. Actor Fouad Hajji, who played Komiteh, is of Moroccan descent. Escape from Iran: The Canadian Caper, a 1981 television film about the "Canadian Caper". On Wings of Eagles, a 1983 novel by Ken Follett, about Ross Perot's successful rescue of several of his employees from Iran just after the revolution. ^ "Argo". British Board of Film Classification. June 29, 2012. Retrieved September 18, 2012. ^ a b c "Argo (2012)". Box Office Mojo. Retrieved April 27, 2013. ^ a b c d e f Bearman, Joshuah (April 24, 2007). "How the CIA Used a Fake Sci-Fi Flick to Rescue Americans from Tehran". Wired. ^ Killoran, Ellen (October 13, 2012). "'Argo' Review: Ben Affleck Pinches Himself In Stranger-Than-Fiction CIA Story". International Business Times. Retrieved February 25, 2013. ^ McNary, Dave (February 3, 2011). "Affleck in talks to direct 'Argo'". Variety. Archived from the original on November 9, 2012. ^ Sneider, Jeff (June 10, 2011). "Alan Arkin first to board 'Argo'". Variety. Archived from the original on November 9, 2012. ^ "Scenes from 'Argo' shot in 'Los Angeles'". filmapia. Retrieved February 25, 2013. ^ "Affleck starts shooting 'Argo' film in LA". United Press International. September 12, 2011. ^ Egan, Jack (December 18, 2012). "Contender – Director of Photography Rodrigo Prieto, Argo". Below the Line. Retrieved January 4, 2015. ^ Haithman, Diane (December 31, 2012). "OSCARS: Re-Creating The Look Of The '70s For 'Argo'". Deadline Hollywood. ^ Higgins, Bill; Kit, Borys (September 26, 2012). "The Odd Hollywood History Behind Ben Affleck's 'Argo'". Hollywood Reporter. Retrieved December 12, 2016. ^ Lane, Anthony (October 15, 2012). "Film Within A Film". The New Yorker: 99. Retrieved July 17, 2013. ^ Leopold, Jason (April 6, 2016). "The CIA Helped Produce an Episode of 'Top Chef'". VICE. Retrieved January 30, 2017. ^ Johnson, Adam (April 8, 2016). "CIA's Work With Filmmakers Puts All Media Workers at Risk". FAIR.org. Retrieved December 12, 2016. ^ Leopold, Jason; Henderson, Ky (September 9, 2015). "Tequila, Painted Pearls, and Prada — How the CIA Helped Produce 'Zero Dark Thirty'". VICE. Retrieved December 12, 2016. ^ "Argo (2012)". Rotten Tomatoes. Fandango Media. Retrieved March 15, 2019. ^ "Argo Reviews". Metacritic. CBS Interactive. Retrieved February 27, 2018. ^ "18 of the Most Loved or Hated Movies: Films That Got A+ or F CinemaScores (Photos)". Thewrap.com. June 16, 2015. Retrieved December 12, 2016. ^ a b Ebert, Roger (10 October 2012). Argo. Chicago Sun-Times. Retrieved January 16, 2013. ^ a b Fish, Stanley (October 29, 2012). "The 'Argo' Caper". The New York Times. Retrieved January 4, 2013. ^ Parry, Robert (March 7, 2013). "'October Surprise' and 'Argo'". Consortium News. Retrieved July 30, 2013. ^ Ghomeshi, Jian (November 2, 2012). "Argo is crowd-pleasing, entertaining – and unfair to Iranians". Globe and Mail. Retrieved November 5, 2012. ^ Cole, Juan (January 26, 2013). ""Argo" as Orientalism and why it Upsets Iranians". Informed Comment. Retrieved February 26, 2013. ^ Mostaghim, Ramin; Alexandra Sandels (November 3, 2012). "U.S. film 'Argo' not getting any buzz in Iran". Los Angeles Times. Retrieved January 9, 2013. ^ Saeed Kamali Dehghan (November 13, 2012). "Why Argo is hard for Iranians to watch". The Guardian. Retrieved February 25, 2013. ^ Fassihi, Farnaz (February 1, 2013). "Iran's Latest Hit: Bootleg 'Argo' DVDs". Wall Street Journal. Retrieved December 14, 2018. ^ "Argo Blu-Ray". Blu-Ray. Retrieved January 17, 2013. ^ Carneiro, Bianca (January 10, 2013). "'Ben Affleck was robbed': Best actor nominee Bradley Cooper on Argo star's Oscars snub". Daily Mail. Retrieved January 10, 2013. ^ Macatee, Rebecca (January 10, 2013). "Ben Affleck's Oscars Snub: Bradley Cooper, Seth MacFarlane Think Argo Director Was Robbed". E! Online. NBCUniversal. Retrieved January 10, 2013. ^ "Quentin Tarantino thinks Ben Affleck's Oscar snub was worse than his". NDTV Movies. February 18, 2013. Retrieved February 25, 2013. ^ "The Oscars / 2013: Eyes on the Prize". Entertainment Weekly. New York: Time Inc.: 22 January 25 – February 1, 2013. ^ "Argo: Iran hostage crisis film fiddles with the facts | CTV British Columbia News". Bc.ctvnews.ca. Retrieved August 1, 2013. ^ a b c d Johnson, Brian D. (September 12, 2012). "Ben Affleck rewrites history". Macleans. Retrieved September 19, 2012. ^ Knelman, Martin (September 13, 2012). "TIFF 2012: How Canadian hero Ken Taylor was snubbed by Argo". Toronto Star. Archived from the original on October 16, 2012. Retrieved September 19, 2012. ^ a b c d e Knelman, Martin (September 19, 2012). "Ken Taylor's Hollywood ending: Affleck alters postscript to 'Argo'". Toronto Star. Retrieved September 19, 2012. ^ Coyle, Jim (October 7, 2012). "'Argo': Former ambassador Ken Taylor sets the record straight". Toronto Star. Retrieved November 1, 2012. ^ McDevitt, Caitlin (February 22, 2013). "Jimmy Carter: 'Argo' great but inaccurate". Politico. Retrieved February 22, 2013. ^ "Ben Affleck's Argo UK Diplomats Deny Movie Slur". The Mail. February 26, 2013. Retrieved April 5, 2016. ^ "Opinion: Ben Affleck must apologise to NZ for Argo's deception". 3 News NZ. February 27, 2013. ^ "NZ's role in Iran crisis tainted in Affleck's film 'Argo' – Story – Entertainment". 3 News. Retrieved October 29, 2012. ^ Film. "Ben Affleck's new film 'Argo' upsets British diplomats who helped Americans in Iran". Telegraph. Retrieved October 29, 2012. ^ a b c d Barrett and Jacqui Goddard, David (October 20, 2012). "Ben Affleck's new film 'Argo' upsets British diplomats who helped Americans in Iran". The Telegraph. Retrieved October 21, 2012. ^ a b Martin Williams (March 2, 2013). "I rescued Argo hostages in my orange Austin Maxi... it had a GB sticker on! Hit film lauds American heroes and claims Brits refused to help, but our man in Iran reveals the real story". Daily Mail. ^ "Motions—Iran Hostage Crisis—Fictional Representation of Role of New Zealand Diplomats". Hansard Office, New Zealand Parliament. March 12, 2013. Retrieved March 13, 2012. ^ "Movie Argo 'misled the world'". Herald Sun. March 12, 2013. Retrieved March 12, 2013. ^ a b c d Dowd, Vincent (January 14, 2013). "Argo: The true story behind Ben Affleck's Globe-winning film". BBC. Retrieved February 25, 2013. ^ a b Mendez, Antonio J. (Winter 1999–2000). "CIA Goes Hollywood: A Classic Case of Deception". Studies in Intelligence. Central Intelligence Agency. Retrieved November 1, 2010. ^ Yukon Damov (November 16, 2012). "Diplomats in Iranian hostage crisis discuss Argo: Spoiler alert: Hollywood fudged the facts". The Newspaper. Archived from the original on February 9, 2016. Wednesday night's conversation between former diplomats Robert Anders and Michael Shenstone, hosted by the U.S. Consulate and the University of Toronto International Relations Society, was an exercise in displaying Hollywood's manipulation of historical reality. ^ 19 Photos (October 10, 2012). "Tony Mendez, clandestine CIA hero of Ben Affleck's 'Argo,' reveals the real story behind film smash". Washington Times. Retrieved October 29, 2012. ^ Martin, Douglas (January 4, 2013). "John Sheardown, Canadian Who Sheltered Americans in Tehran, Dies at 88". New York Times. Retrieved February 24, 2013. ^ "How accurate is Argo". Slate. Retrieved November 15, 2012. ^ Dowd, Maureen (February 16, 2013). "The Oscar for Best Fabrication". New York Times. Retrieved February 25, 2013. ^ a b Higgins, Bill; Kit, Borys. "Argo's odd Hollywood history." Hollywood Reporter. October 5, 2012: 64. eLibrary. March 1, 2013. ^ Patrick Smith (March 1, 2013). ""Argo" and the 747". Askthepilot.com. Retrieved August 17, 2015.